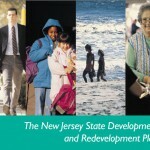 A badly needed update to New Jersey’s State Development and Redevelopment Plan is not yet back on track, though now a year behind schedule. This month the State Planning Commission resolved several mapping controversies that had stalled the update process since May. Importantly, the Commission agreed to release an environmental analysis that will aid counties in ensuring local planning conforms to the State Plan. Before the updating or “cross acceptance” process can resume, however, the Commission must resolve some 70 policy issues raised by counties. New Jersey’s blueprint for guiding development and preservation has never played a more vital role in managing the state’s growth. In recent years, state agencies have turned to the State Plan to guide the setting of utility fees, the protection of drinking water supplies, the growth of coastal communities, as well as the location and extent of affordable housing. State courts have relied on the Plan to affirm local zoning when zoning is consistent with the Plan. Nearly 70 communities, either individually or regionally, have petitioned to have their local plans “endorsed” as consistent with the State Plan, qualifying these communities for a higher priority for available state funding, streamlined permit reviews and coordinated state agency services. Yet a badly needed update to the four-year-old plan has languished, in large part because the State Planning Commission has failed to provide sufficient guidance on how to apply State Plan policies to local issues, particularly in the Plan endorsement process. It’s guidance that is sorely needed. The Commission took the right step when it agreed in September to release an environmental analysis to the counties. Since the State Plan map is designed in part to help municipalities target local growth planning and zoning, identification of significant environmental and regulatory constraints up front can improve the predictability of subsequent plans and outcomes. But more needs to be done. Urgently awaiting resolution are questions on how to take best advantage of mapping technology and Geographic Information Systems (GIS) information, as well as how to incorporate local wastewater plans once updated into the Plan. And the cross acceptance process would move more quickly and efficiently if more clear guidelines were offered on how state agencies and the state Office of Smart Growth should respond to county requests for changes to the Plan. New Jersey Future welcomes this month’s heightened involvement by the Commission in addressing key issues, and will continue to press the Commission and state agencies to move ahead with updating this critical guide to New Jersey’s growth.